DESERET NEWS, Salt Lake City, Utah Territory, 1880 Uncommon title from this Mormon city. The issue shown is representative of the look and condition of what you will receive. While actual dates vary, the issue will be dated in 1880 and will have the look/condition similar to what is shown in the image. Due to the use of rag paper, the issue is in very good condition. Nice to have from more than a dozen years before Utah would become a state. Background (source - wiki): The Deseret News is a newspaper published in Salt Lake City, Utah, and is Utah's oldest continuously published daily newspaper. It was first published on June 15, 1850. 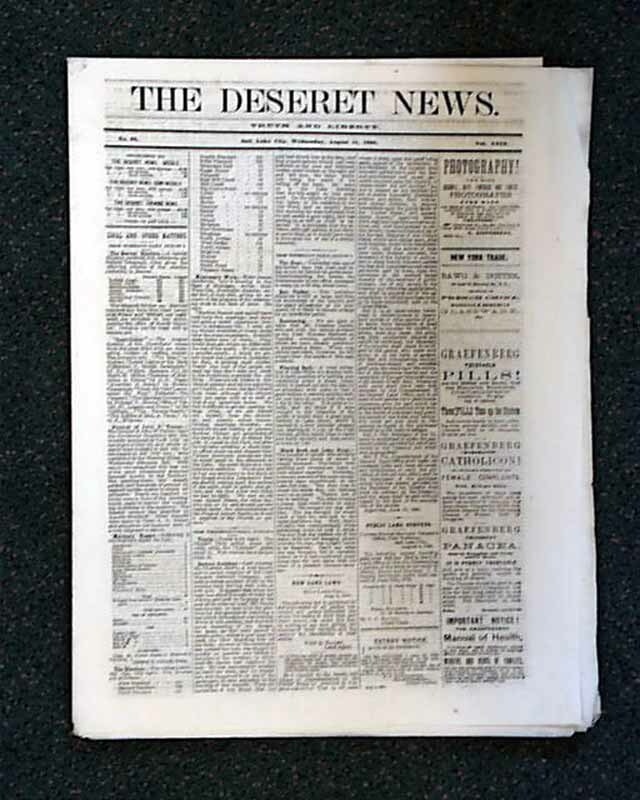 It was named Deseret News because it was the voice of the then State of Deseret. Originally a weekly paper, the Deseret News became a semi-weekly in October, 1865 and was named the Deseret Evening News.